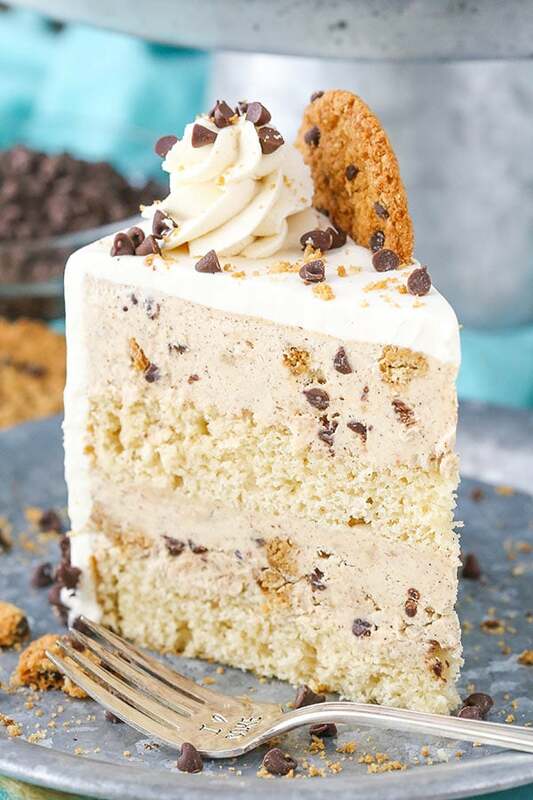 This Oatmeal Chocolate Chip Cookie Ice Cream Cake is full of chocolate chips, oatmeal cookies and one of my favorite food groups – dairy! 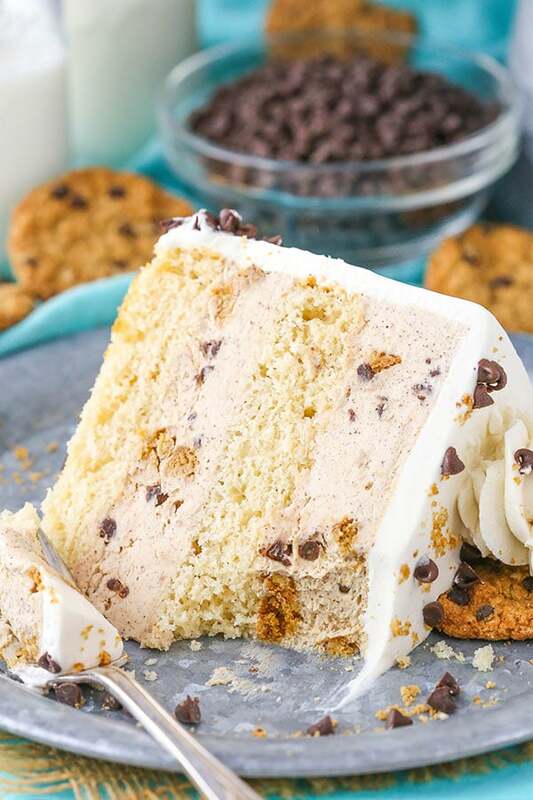 It’s a delicious combination of ice cream, cake and cookies that’s perfect for summer! This post is sponsored by The American Dairy Association Mideast, but all opinions are my own. Did you know that June is National Dairy month? Well, it is! And in partnership with The American Dairy Association Mideast, we are celebrating the work of diary farmers in Ohio and West Virginia. Those dairy farm families raise more than 274,000 dairy cows on about 2,500 dairy farms. In an average year, Ohio and West Virginia dairy cows produce approximately 5.6 billion pounds, or about 656 million gallons, of milk. So much milk! Not only do we need that milk for drinking, we also need it for ice cream making. About 9% of all the milk produced by U.S. dairy farmers is used to produce ice cream and June happens to be the month that the most ice cream is produced throughout the year. So today I’m all about celebrating with an ice cream cake! 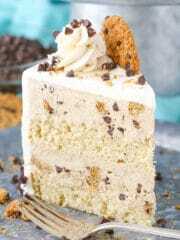 This cake uses all kinds of dairy – milk, butter, cream cheese, heavy cream and more! Bring it on! 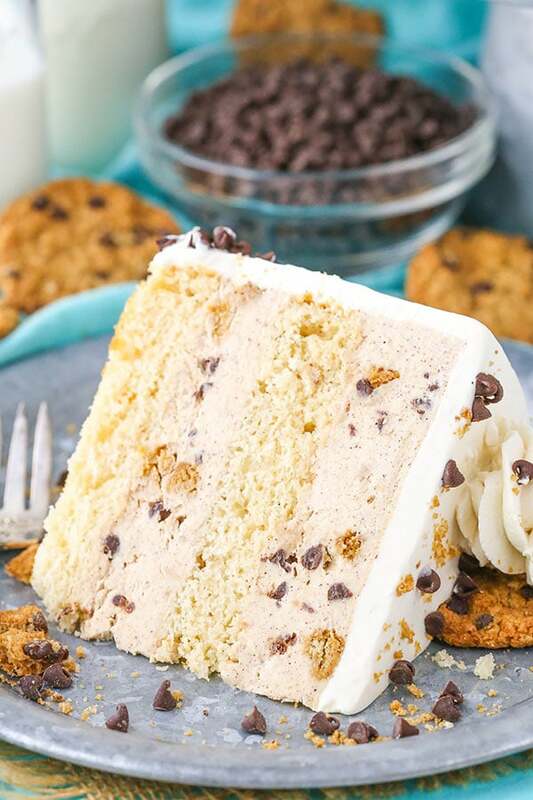 To get started making this ice cream cake, you’ll want to make the brown sugar cake layers. I love the flavor the brown sugar gives the cakes. It’s one of the things that gives cookies such great flavor, so it’s perfect in the cakes! The cake starts with the traditional creaming method for the butter and sugar. It’s a very important step for adding air to the batter to get that airy texture, so be sure not to skimp on the creaming time. Once the cake is baked and cooled, it’s time for the ice cream! This isn’t really your traditional ice cream. 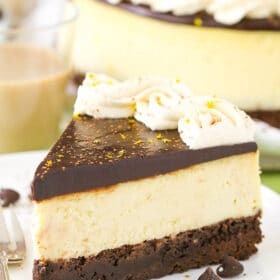 I find that when making ice cream cakes, layering can be difficult with the more traditional ice cream since it melts so easily. This ice cream is sort of a “mock” ice cream that is stabilized with cream cheese. You don’t even notice the cream cheese though! I’ve used this cream cheese based ice cream over and over and nobody can ever tell! The ice cream is flavored with more brown sugar, cinnamon, mini chocolate chips and broken up oatmeal cookies. It’s got all the great flavors of an oatmeal chocolate chip cookie that I love so much! And the light crunch from the mini chocolate chips is just the right amount of texture! To build the cake, you can use a clear cake collar or build the cake right within your cake pan. The cake collar is a little simpler and more straight forward, but the cake pan works well too. I’d suggest an 8×3 inch cake pan, so the sides are taller and will help everything stay in place as you build the cake. 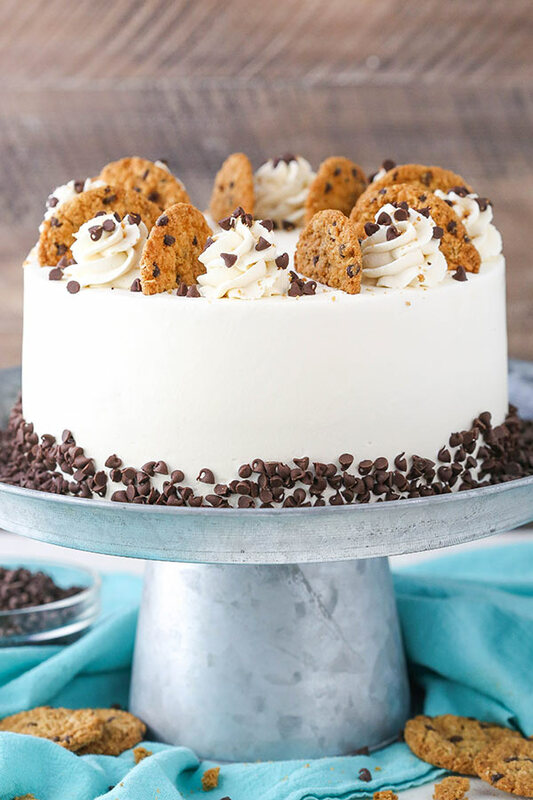 Once the cake has been layered and frozen, it’s frosted with a brown sugar whipped cream and decorated with some oatmeal chocolate chip cookies and mini chocolate chips! It’s such a fun and festive cake not only for dairy month, but also for summer! 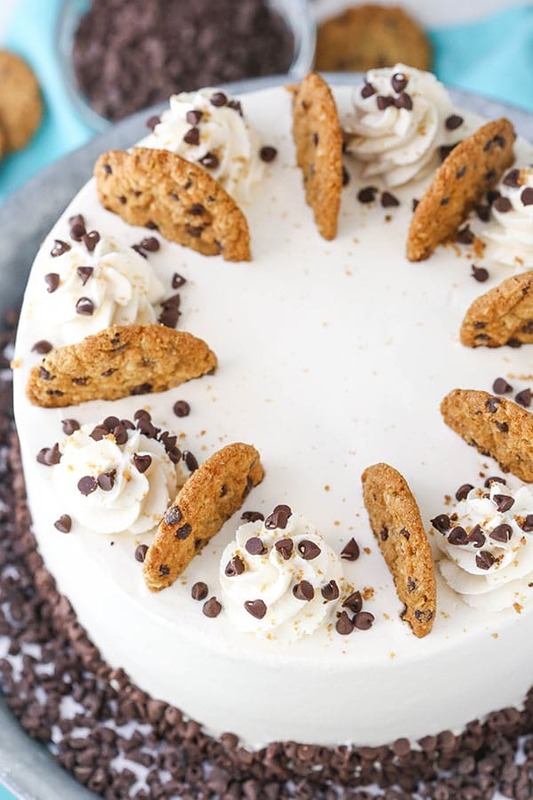 With a little bit of cookies, cake and ice cream in one, who wouldn’t fall in love?! NOTE: 8×3-inch springform pans are great for building this cake so that you can easily remove the cake once it’s been assembled. If you do not have a springform pan, line your cake pan with clear wrap before adding your parchment paper and cake board. You can use the clear wrap to lift your cake out of the pan once it’s assembled and frozen. You want to make your cake layers in the same pan you’ll use for layering the ice cream and cake together so that the cake layers fit in the final pan you use for layering. In lieu of using a cake pan to build the cake, you could also use cake collars, which are easiest. 1. Prepare two 8 inch springform or cake pans with a parchment paper circle in the bottom and grease the sides. Preheat oven to 350°F (176°C). 2. In a large mixing bowl, cream the butter and sugars together until light in color and fluffy, about 3-4 minutes. Do not skimp on the creaming time. 7. 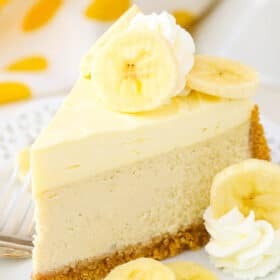 Pour the batter evenly into the cake pan and bake for about 18-20 minutes, or until a toothpick comes out with a few crumbs. 8. Remove the cake from the oven and allow to cool for about 2-3 minutes, then remove to a cooling rack to cool completely. 9. In a large mixer bowl, combine the cream cheese and brown sugar and mix until smooth. 10. Add the milk, vanilla extract and cinnamon and milk until well combined and smooth. Set aside. 11. In another mixer bowl, add the heavy whipping cream and powdered sugar and whip on high speed until stiff peaks form. 12. Gently fold the whipped cream into the cream cheese mixture until well combined. 13. Gently fold in the mini chocolate chips and oatmeal cookie pieces until combined throughout. 14. 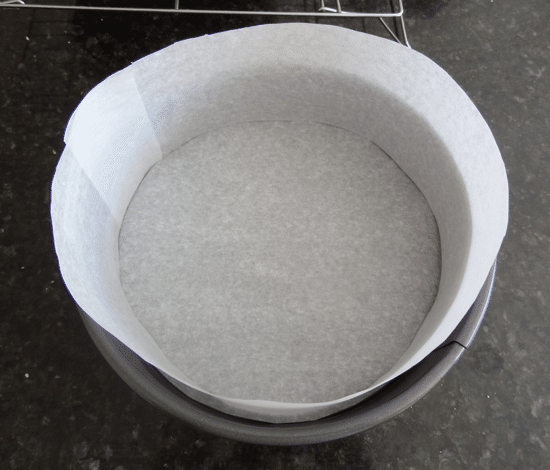 Line the sides of an 8-inch springform pan with parchment paper. The parchment paper should stick up above the top edge of the pan, since the cake will probably be a little taller than your pan (see example). If you want to, put a cardboard cake circle in the bottom of the pan. If not using a springform pan, you pan put some plastic wrap in the bottom of the pan and up the sides and use it to lift the cake out of the pan when it’s done. If using a clear cake collar, wrap it around the bottom layer of the cake and secure in place with tape. 15. Cut the dome off of the tops of the cake layers. Place the first cake layer into the bottom of the pan. 16. Spread half of the ice cream mixture evenly over the cake layer. 17. Top the ice cream with the other layer of cake, then add the remaining ice cream. 18. Freeze cake until firm, 6-8 hours or overnight. Once frozen, remove from springform pan and remove parchment paper from sides, or remove the clear cake collar. 19. To make the whipped cream frosting, whip the heavy whipping cream, powdered sugar, brown sugar and vanilla extract on high speed until stiff peaks form. 20. Frost the outside of the cake with the whipped cream, then pipe swirls around the top edge. 21. 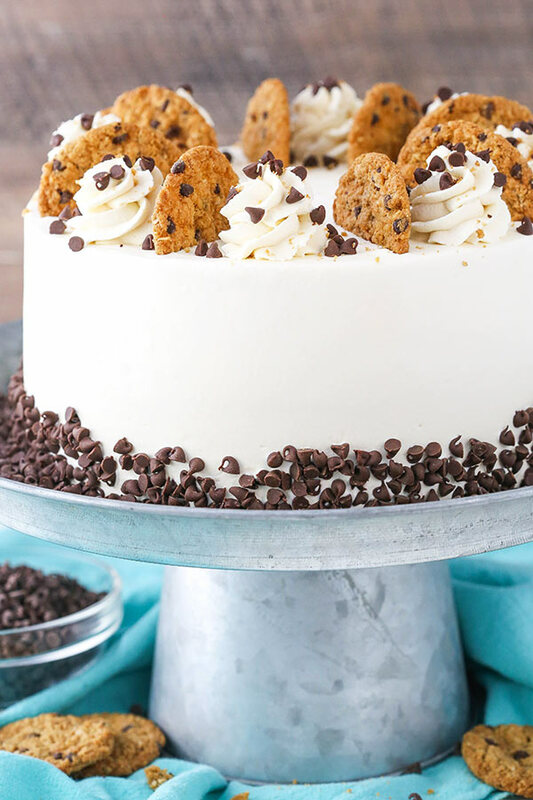 To finish off the cake, press mini chocolate chips onto the sides of the cake and top it with oatmeal chocolate chip cookies, if desired. 22. Freeze the cake until ready to serve. Allow to thaw for 45 minutes to an hour before serving. Thanks so much Amanda! I hope you’re able to give it a try! Did you make your own oatmeal chocolate chip cookies or did you purchase them and if so, what brand did you use? I have several of your creations and always get rave reviews, but I always give the credit to you and your blog. Thank you for such amazing recipes! I bought them. They were just the store brand plain oatmeal cookies. I’m so glad to hear the recipes have been a hit! where is the video for this cake? This recipe doesn’t have a video with it. I’m in the process of this cake now! I made oatmeal chocolate chip cookies and the cake layers yesterday. I’m making the ice cream today but realized I’m short just half an ounce of cream cheese. Would you recommend replacing that half ounce with anything, or should I be fine without? Thanks! I’m super excited to see and taste this! No, it should be fine without it. I hope you enjoy it!! Recipe was easy to make and the cookies came out delicious. My family loved it so much that I’m making them again for Father’s Day.